While you now touch your smartphone more than your partner, you’ve probably made less effort to find out any more about what’s on the inside. If you found out your husband or wife was involved with child slavery, you’d certainly have to reconsider your relationship. I don’t know how you pick your partner, but your smartphone, your real best mate, actually probably is. He found that Nokia appears to be the manufacturer most conscious of its ethical footprint, in terms of trying to get the precious metals that it takes to build a smartphone, tantalum, tungsten, tin and gold, from legal sources. He found the policies of the operators who sell smartphones and other manufacturers to be less convincing. Scenes of riots in Apple’s factories in China have been beamed around the world, while Samsung recently admitted after another Guardian investigation that its phones contain tin mined from an area that uses child labour and where 150 miners die every year. 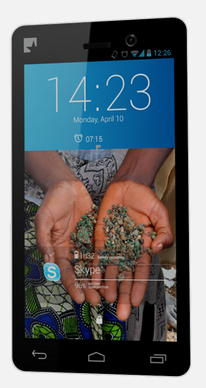 FairPhone‘s sleek Android handset has been three years in the making and it has now gone on pre-sale. The company needs 5,000 buyers of the £275 device in order to get the first batch out the door. The company says it has created an alternative for the “thing we can’t live without” with a transparent supply chain and ethical principles built-in. All the metals it contains come from conflict-free mines and the company says it has focused on improving the wages and conditions of its factory workers it China. For every Fairphone sold, €3 goes to removing e-waste from Ghana and in September, a shipping container filled with 100,000 phones and batteries will head to Belgium to be safely recycled. They encourage people to sell their old phones to recycling services, something they will introduce for Fairphones. Among their mantras is “reduce, reuse, refurbish, recycle”. “Our end goal is fewer phones in circulation – not more!” Which is a probably a scary prospect for our throwaway consumers and manufacturers. But what about the specs? It is the running the latest version of Android, Jelly Bean, and its chipset is up there with the Samsung S4 as a 1.2GHz quadcore. But its 1GB of RAM and extra 20g doesn’t quite match up. Other than that, it has the full front/back camera, glass frontage and 16GB of internal memory. And there probably ain’t anything quite like the feeling in your heart when you can pick up your best friend knowing that you won’t get blood on your hands. Written for Mobile Marketing Magazine and published here. This entry was posted in ethical consumption, fairphone, fairtrade, manufaturing, Mobile Marketing Magazine, smartphone on May 28, 2013 by kirstystyles1.